Claude's Steak Sauce is the third Claude's product that I've had the opportunity to review. I previously reviewed their Hot & Spicy and Variety sauces. With Claude's hailing from the Lone Star state, I was anxious to sample their take on steak sauce. 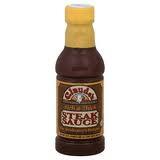 Like all of Claude's products, their Steak Sauce is packaged in 16 oz plastic bottles. The labels are simple and distinct. The sauce is dark red like a Kansas City BBQ sauce. It's much thicker than an A1 style sauce. It pours slow and smooth. Claude's Steak Sauce starts with a tomato paste base and adds a variety of savory elements like garlic, pepper, onion and real hickory smoke flavor. The sauce is also slightly sweet thanks the addition of papaya juice, molasses and other natural sweeteners. The aroma and flavor is somewhat akin to a BBQ sauce. I would characterize it as half BBQ sauce and half A1 style steak sauce. I used this sauce to accompany grilled New York strips. Later I poured a bit of the sauce over a cheese steak. I like the sauce's flavor when paired with the meat. It was an especially good compliment to the black pepper rub that I used on the steaks. The flavors are substantial and savory. The hint of sweetness is a nice touch as well. Claude's Steak Sauce is a tasty option for those that like to sauce up their grilled beef. It works well as a dip, but could also be a good condiment on burgers. Additionally, I think it would be a good change of pace to use on grilled chicken. Visit Claude's website to order your own Steak Sauce. See how it rates on our "Product Reviews" page. 0 Response to "Claude's Sauces Steak Sauce"